Latest from the Sports fraternity is Uganda Cranes star William Kizito Luwagga leaving Azherbeijan’s FC Bate Borisov for another Loan Spell at Kazakhstan giants FC Shakhter Karagandy. Kizito Luwagga was loaned to Bate Borisov by his Romanian side Politehnica Lasi last year but has been struggling for playtime and this might be reason towards his move. The talented right-winger broke the news through his official Facebook account saying he was eager for a new opportunity. “A new opportunity. Another chance A new beginning .” He posted. Shakhter Karagandy that is one of the giant clubs in Kazakhstan, having won the Kazakhstan Premier League twice in 2011 and 2012, the Kazakhstan Cup and Kazakhstan Super Cup in 2013 becomes Luwagga Kizito’s seventh club he has featured for in Europe. The others include Covilha, Leixoes, Feirense, Rio Ave and CMS Lasi. 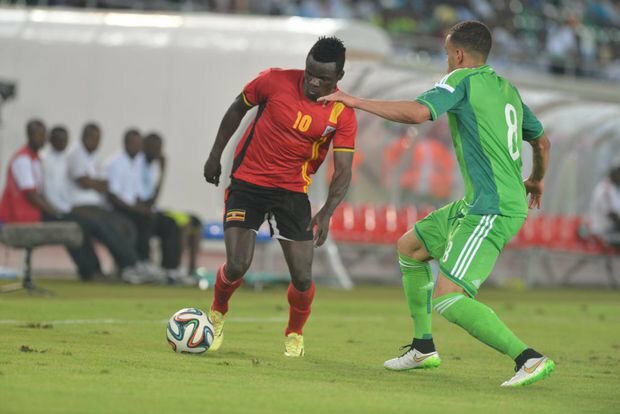 Kizito Luwagga who wasn’t called up for the national duties ahead of the AFCON 19 Last Qulifying match against Tanzania the next weekend now becomes the fourth Ugandan to play in Kazakhstan after Andy Mwesigwa, Savio Nsereko and Crested Cranes forward Fazila Ikwaput.